The Frank N. Bash Visitors Center at the McDonald Observatory aims to inform, educate, and inspire the public. Our programs include daily tours of the large research telescopes, Star Parties under some of the darkest night skies in the continental United States, and Special Viewing Nights on some of the largest telescopes in the world routinely available for public observational programs. The Visitors Center is your starting point for all public programs. Inside, exhibits explain what astronomers do at the observatory. The Visitors Center also includes a theater, gift shop, and cafe. The Visitors Center is open 10 a.m. to 5:30 p.m. everyday except Thanksgiving, Christmas, & New Year's Days. There are extended hours on Star Party nights Tuesday, Friday and Saturday. 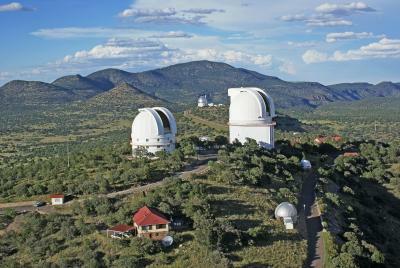 Important: McDonald Observatory, part of the University of Texas at Austin, is located 450 miles west of Austin and is on Central Time. As a University of Texas campus, the Observatory grounds are "concealed carry" only.